A heavy tank with a flexible weapon system to react fast on the enemys actions. Goldcost has to be lowered to 3500! 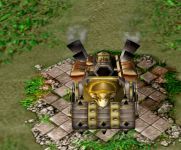 Mounts the tank with Grenades, causing the main attack to deal splash damage. Mounts the tank with Improved Engines. This engines increases the attack speed of the main attack by +100%. Mounts the tank with an Optic System. This system detects invisible units in 600 range around this tower. Mounts the tank with Boss Killers. This weapon increases the damage against bosses. Mounts the tank with a Flamethrower. This weapon automatically attacks a random target in range and burns it for 10 seconds, dealing 50 damage per second. Last edited by Natac on Tue Dec 15, 2009 12:04 am, edited 1 time in total. isnt 100% attackspeed the same like one extra projectile? Or am i getting something wrong? And 100% damage should be better in raw dps then 100% attackspeed? Bonus damage would be equal to 2 Projectiles firing. with 100% bonus speed : new atk spd: 0,975 , results in 1959 dps. and i think aoe will be useful for mass rounds too. I think its fairly balanced. Yes, it should be all the same. And the trigger chances are increased, yes. But only if u get the right items on this tower. But there are also items that does something percentage to the towers damage, so "Improved Weapons" are better in this case. Every "weapon" has it pros and cons. "Improved Engines" has increased trigger chances (of items only, cause the tower itself has none). This tower costs to much. Rare towers should not cost more than 3500 gold. The 1st member of this family has 1 slot. So 50% of the damage are dealt from the normal attack and the other 50% are dealt from the mounted weapon. The 2nd member of this family has 2 slots. So its main attack only deals 33% of the overall damage. The other 66% are dealt by the slots (33% from each). This last one has 3 slots. So its main attack is only 25% of the damage output. The other damage is dealt by the 3 slots (25% from each). The problem is: Its very ugly if a higher family member has a lower damage. And if i lower this tower price to 3500 it will deal 1714 dmg. Which is a very small difference to the 1587 dmg of the previous family member. Afar from that all 11 weapons are balanced for 3900 goldcosts. So I've to rework the whole family (including all 21 weapons (3+7+11)) to reduce the prize of this tower by 400. I dont know this is worth the trouble. I know it's a lot of work but it can be a reason to not approve this tower. Don't know what geX thinks about this. I'll wait for geX comment anyway, cause this is a very special tower concept. And i want to do the most work with one update. Okay, the family will be changed then. Any idea how to balance the single weapons? Cause changing the tower stats (range, cooldown, targets), run GSMI and using the calculated dps for the weapon doesnt seems to work (see cannon). Any suggestions! ?